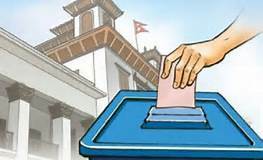 Update: Today 26th November 2017, Nepal is holding the first phase of Federal Parliamentary and Provincial Assemblies Election under new federal structure, which it adopted in 2015 with the promulgation of the new constitution by the cabinet. The first phase of election will covers 32 districts of the total 77 districts of the country. Correspondingly, the second phase is taking place on December 7 in 45 districts of the Terai and hills. With the pre-poll violence on rise, the Government of Nepal has deployed Nepal Army Security personnel for the election who will be placed in the third or the last layer of security ring. . Around half a dozen small bombs were exploded in various parts of the country over the weekend targeting candidates, in which at least a dozen people were injured. Police arrested different rebels who were involved in the violence and anti-poll activities with excessive harms. Different district staffs, members and volunteers of the Women’s Foundation are observing the first phase of the Federal Parliamentary and Provincial Assemblies Election 2017. The polls on Sunday opened at 7 a.m. and will close at 5 p.m. The vote counting of the elections will only start after the completion of the both rounds of election. We courage for the peaceful election with voting rights environment!